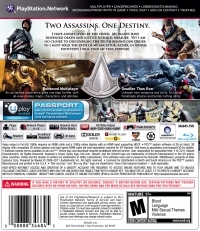 Box Text: Two Assassins. One Destiny. I have always lived by the creed. My blades have dispensed death and justice in equal measure. Yet I am no closer to discovering the truth behind our Order. So I must walk the path of my ancestor, Altaïr, in whose footsteps I will find my true purpose. An acclaimed experience goes one step further with all-new modes, maps, characters, and abilities. Unleash new weapons and skills, including hookblade attacks and bombcrafting skills. 05-07-2017 dankzappa Box Text Two Assassins. One Destiny. I have always lived by the creed. My blades have dispensed death and justice in equal measure. Yet I am no closer to discovering the truth behind our Order. So I must walk the path of my ancestor, Altaïr, in whose footsteps I will find my true purpose. •Enhanced Multiplayer An acclaimed experience goes one step further with all-new modes, maps, characters, and abilities. •Deadlier Than Ever Unleash new weapons and skills, including hookblade attacks and bombcrafting skills. 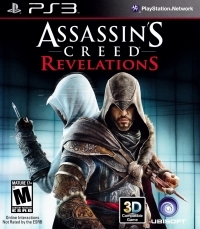 05-30-2012 matt Description In Assassin's Creed Revelations, master assassin Ezio Auditore walks in the footsteps of the legendary mentor Altair, on a journey of discovery and revelation. It is a perilous path ï¿½one that will take Ezio to Constantinople, the heart of the Ottoman Empire, where a growing army of Templars threatens to destabilize the region. In addition to Ezio's award-winning story, a refined and expanded online multiplayer experience returns with more modes, more maps and more characters, allowing you to test your assassin skills against others from around the world.